Experts: What do businesses need to increase trade across borders? More than a dozen panelists discussed the growing number of business opportunities popping up across borders at the North America Economic Connectivity Conference last week. The problem? The businesses don’t have an easy way to connect with one another. More than one expert suggested they need business versions of the dating sites eHarmony.com and Match.com. 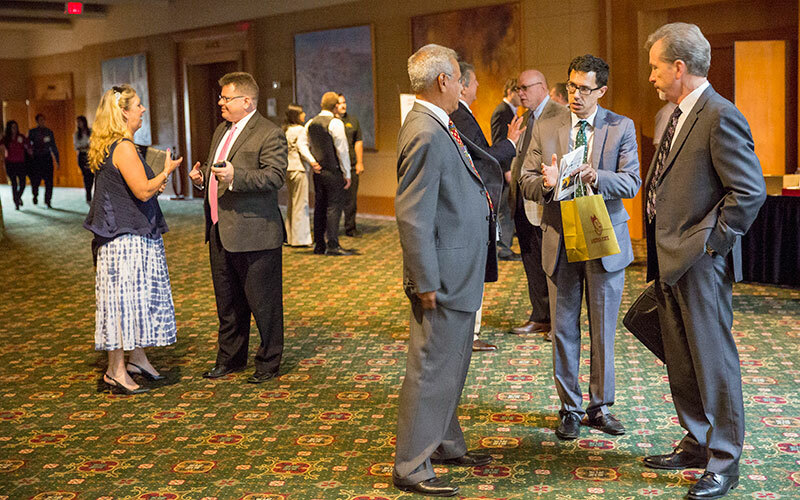 Business leaders, public officials and academics gathered at the Sept. 30 conference at the Phoenix Airport Marriott to discuss business, trade and economic development between Mexico, Canada and the United States. Sapna Gupta, a senior policy analyst at the Morrison Institute for Public Policy at Arizona State University, told the audience that business leaders in Sonora, Mexico, told her they wanted to expand trade with their neighbors in Arizona. “They are eager to do that, but they don’t have the information,” she said. In addition to improving relationships and networking opportunities, the panelists stressed the importance of innovation. Justin Dutram, deputy executive director of the Arizona-Mexico Commission, said traditional sectors such as mining, manufacturing and tourism are great foundations for Arizona’s engagement with Mexico. Yet, he said, prosperity may only come to those who tackle new possibilities. “We need to look at transitioning to new industries and take a look at opportunities in biotechnology and renewable energy,” Dutram said. Gonzalo de la Melena Jr., president and CEO of the Arizona Hispanic Chamber of Commerce, said Arizona is different from other states. He said it is important for business owners to know their region to develop the appropriate strategies. He also stressed the importance of small businesses. De la Melena said Hispanic enterprises are more attracted to trade opportunities across the border. He attributed that tendency to the owners’ cultural awareness of both Mexico and the United States and the greater language skills. “We believe that by unlocking the full potential of the minority, Hispanic business owned firms in the state of Arizona, we can build a more competitive economic marketplace,” de la Melena said. Audience member Daniel Messick, the managing director of Oakes Partners, said the conference was a great platform to exchange knowledge, but he said it lacked a very important element: real people. “We have a whole lot of academics, a whole lot of really bright people with all good intentions, but nobody who is responsible for actually deploying a business and generating profit,” Messick said.